Humidity Indicator Cards - Interteck Packaging, Inc.
And the 5%, 10%, 15% complies with JEDEC Standard 033. 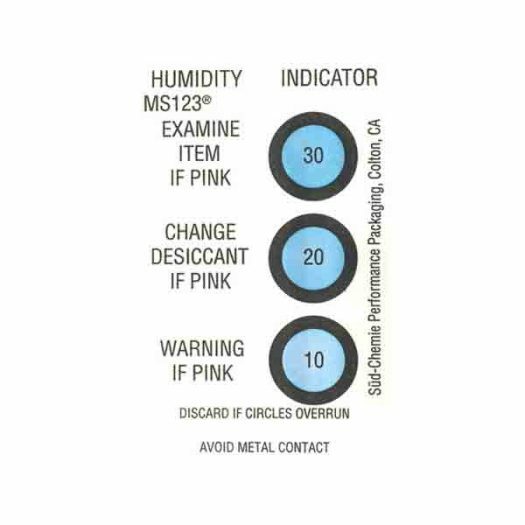 Humidity indicator cards are impregnated with a solution of cobalt chloride that has been carefully mixed to change color from blue through various shades of magenta – red, to a pink. These cards are not precision indicators. However, they are very good at telling you the maximum possible humidity in a container. 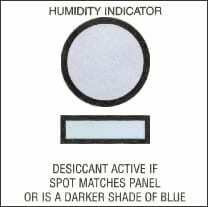 For example if all of the dots are deep blue on a card which is a 10%- 60% card than you can be assured that the humidity in that container is below 10%. This is very important for some products and household items because as long as the humidity is below 40%, basic corrosion (rust) will not occur. Neither will mildew or mold in clothing or paper products. Finally, all sophisticated electronics: video cameras, computers, SLR cameras, sophisticated instruments etc. enjoy a much longer and more reliable life if they are maintained at a very low relative humidity. For example, at the bottom of this page are cards that were developed specifically for the electronics (computer chips) industry. These companies require that the humidity in their shipping packages be below 10% and as of the guidelines established in the fall of 1999 are striving to maintain humidity below 5%. HIC card on the top is outside the bag and shows the humidity is more than 50%. The card sealed in the clear bag along with small packets shows the humidity inside the bag is lower than 10% (all spots are blue). The HIC should comply with MIL-I-8835 and, at a minimum, have three color dots with sensitivity values of 30% RH, 40% RH, and 50% RH. Proper packaging of the lead-free compatible PCB is critical. The packaging system must be carefully developed by the PCB fabricator to protect the PCB from atmospheric moisture that may enter the packaging materials by diffusion. The packaging system should be developed to offer a shelf life of 12 months at ≤40°C and 90% RH. Proper selection of the desiccant should include consideration of the environmental conditions during shipping as these may affect the function of specific desiccant materials. Check with your desiccant supplier for moisture capacity capability in ´units´. PCB’s should be vacuum packed in a width adequate desiccant and humidity indicator card. PCB’s should be packaged immediately after final inspection. The exposure time for the PCB prior to packaging should be minimized to eliminate the potential for moisture/volatile absorption as defined above. Moisture Barrier bags must be hermetically heat sealed with an adequate seal width per manufacturers recommendations to ensure proper bag performance. 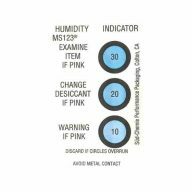 One humidity indicator card should be placed in the bag with the PCB’s. The HIC should be placed adjacent to the desiccant, not on top of the packet(s). The amount of desiccant should provide protection for a minimum of one year. Other packaging materials used in the bag will also have a moisture content. The moisture/volatile content of these materials must be considered in calculating the number of desiccant packets to be used. To determine the proper quantity of desiccant ´units´ to be used in the bag, use the following formula.